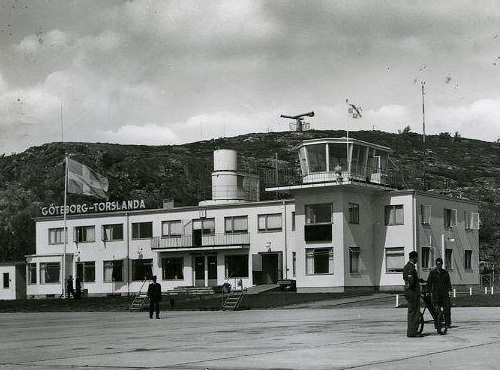 Torslanda Airport — (Swedish: Torslanda Flygplats or Torslanda Flygfält) served the city of Gothenburg, Sweden, as its main airport from 1923 to 1977, when the Gothenburg-Landvetter Airport was opened. The airport closed soon afterwards. 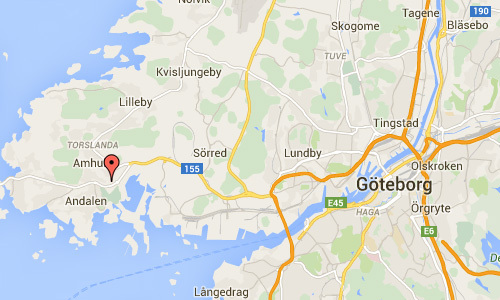 Torslanda is an area in the western part of the island of Hisingen in Göteborg municipality, part of the district West Hisingen. 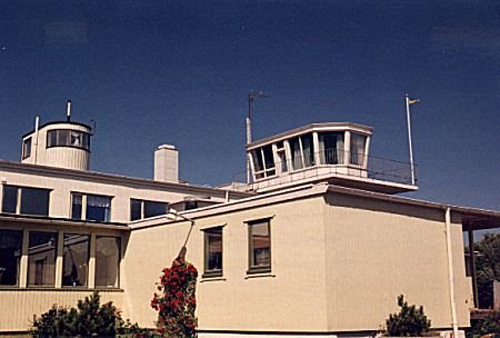 In 1969, an air traffic control tower was built on an adjacent hilltop as replacement for an older tower built in 1938. The airport had been the site of a mishap on 23 December 1967 when a Douglas DC-6B operated by Sterling Airways carrying 55 passengers en route from Stockholm landed 3000 feet beyond the landing threshold. In a notable 1972 incident, a flight also from Torslanda en route to Stockholm was hijacked and diverted to Bulltofta airport outside the Swedish city of Malmö. Nine Croatians imprisoned nearby were traded for 500.000 SEK before flying to Madrid, Spain, before being captured by police. The 1969 control tower remains (as of 2010) as one of the last artifacts of the airport. Most of the old airport was demolished in 1997, when the former runway paving were mainly removed. 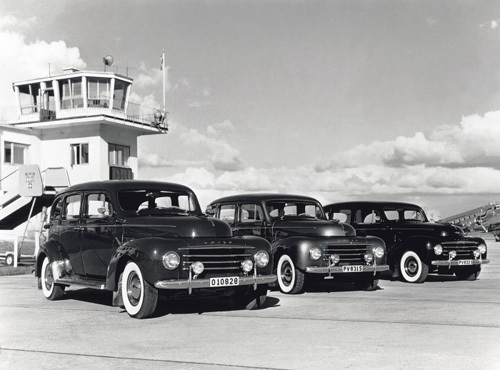 Until 1995, Volvo housed its collection of historic vehicles in “The “Blue Hangar” (Den Blå Hangaren). 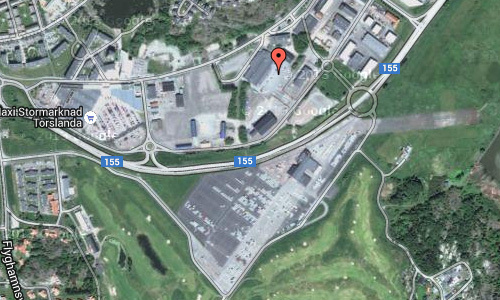 Now they are located in the Volvo Museum, a few kilometres away. 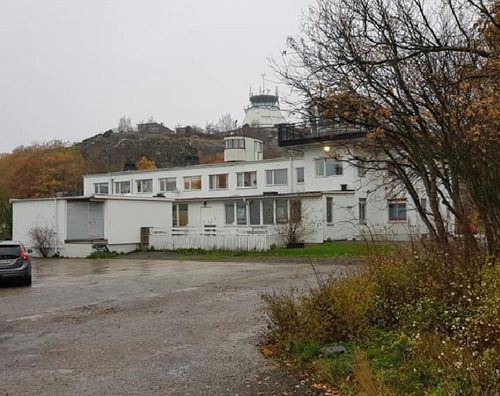 In recent years, the original land from the Torslanda Airport has quickly redeveloped into a residential area known as Amhult, eventually to become a garden village with 900 new homes, a commercial centre, preschool and school. The former runways have partially been used for car testing by Volvo, for driver training and race car testing, and for model aircraft, until the runways were removed. An area is still used for storing ship containers. A golf course has been built over parts of the former runways. The road no 155 to Öckerö went a detour around the north-south runways. Around 1997 the road was rebuilt to go straight across the former runway. This old Torslandahus (or Torslanda House) was built in 1923 and was then the Torslanda Airport arrival hall. Here came the Beatles in 1963 when they were visiting Sweden. Blå Hangaren (or the Blue Hangar), was designed by Malte Erich (1888-1966) and built for the inauguration in 1923 and rebuilt in 1946. The hangar originally measured 60×27 meters and had for those days, a unique roof structure – a cantilever without pillars – and built with wood left over from the construction of Liseberg, the amusement parc in Göteborg. 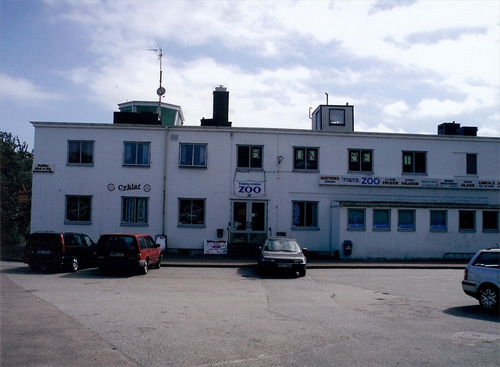 In 1927, it was extenden with, among other things, an angular building for passengers, customs and airline managment and even a radio station. 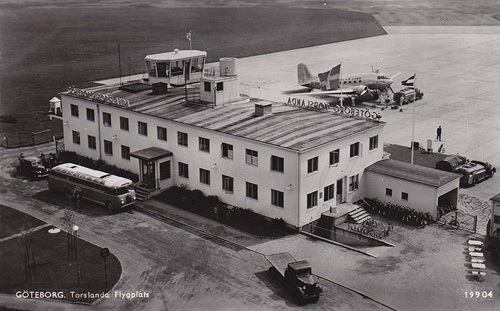 In 1940 a steam house was added and in 1946 changed the hangar gates outside and the front facade was changed. In 1959 the hangar was built out even further when the second helicopter division of the Navy settled there. 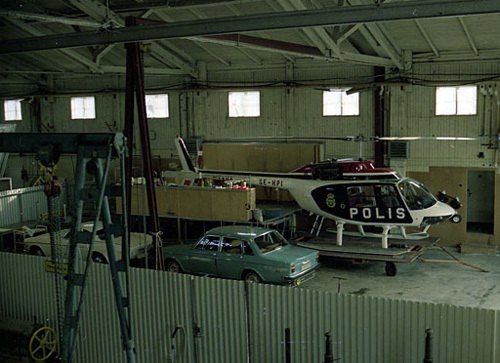 When Navy helicopters in 1970 moved to Landvetter, the police helicopters moved in, and varoious aviation companies. 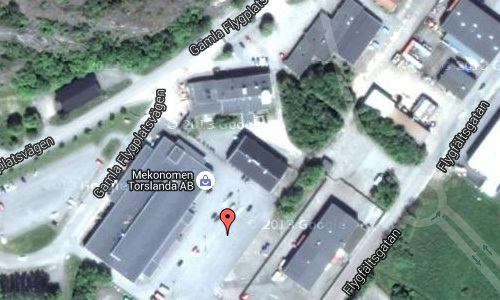 They remained until 1977-1978 when they moved to Landvetter Landvetter. 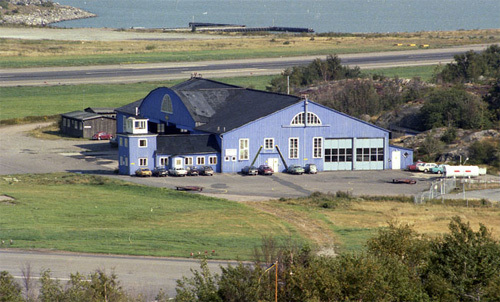 The Blue Hangar was about to become a heritage building, when it was completely destroyed in an fire on May 31, 1980. A little monument marks the place where the hangar once stood. 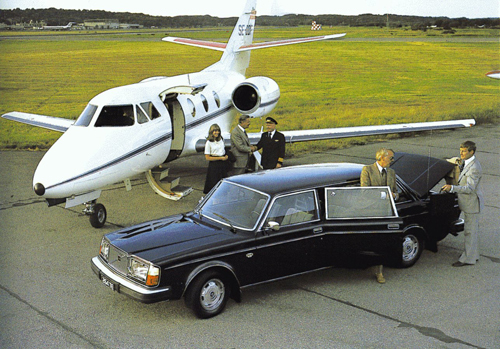 After the closing of the Torslanda Airport as an actual transportation facility (1977), Volvo housed its collection of historic vehicles in the “Blue Hangar” (Den Blå Hangaren) at Torslanda Airport. The collection comprised about 5-6 vehicles, only two of them in working order. Other vehicles were stored across Sweden in various Volvo facilities. Unfortunately, fire destroyed the hangar a few years later, but most of the vehicles escaped unharmed. The collection was moved into a permanent location with the opening of the Volvo Museum in Arendal on Hisingen on May 30, 1995. 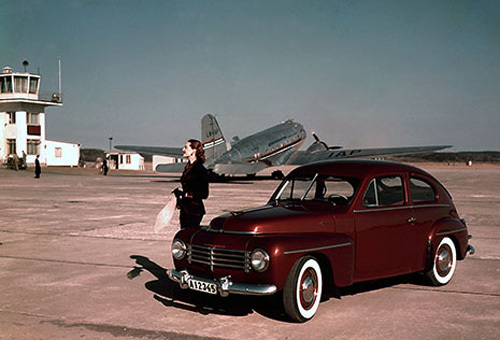 Prior to its use as a defacto museum, the Torslanda Airport hangars had served as presentation spaces for prominent vehicle debuts, including the 1957 Volvo P1900/Sport. 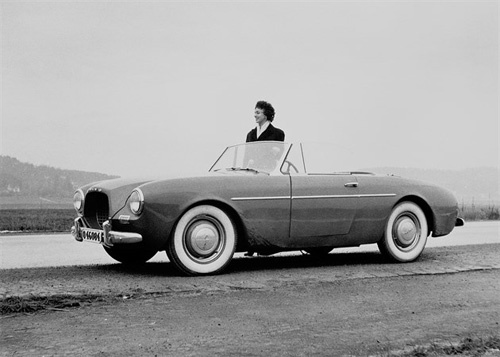 On 2 June 1954 the two-seater roadster, the Volvo Sport, and the company’s first sports car, made its debut. 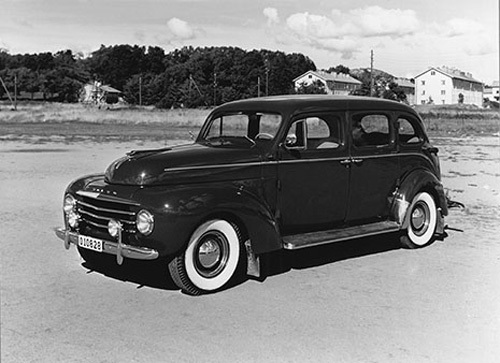 But a low weight and reliable Volvo technology were not enough – production was shut down after just 67 had been built. Or was it 68? The name of the new car was short and sweet – Sport – and it had a short and plump body with a big grill that looked like a turbine. 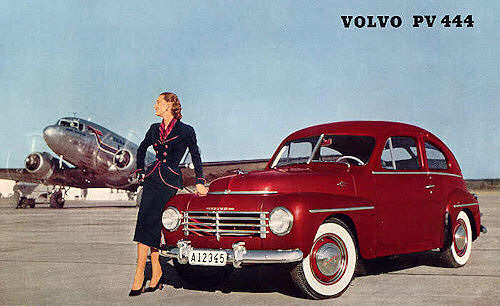 The wheelbase was 20 centimetres shorter than that of the Volvo PV 444, whose mechanics it otherwise shared. Under the hood there was a 1.4 litre tuned version of the PV 444 engine, with twin carburettors and 70 horsepower. The top speed was specified as 155 km/h. 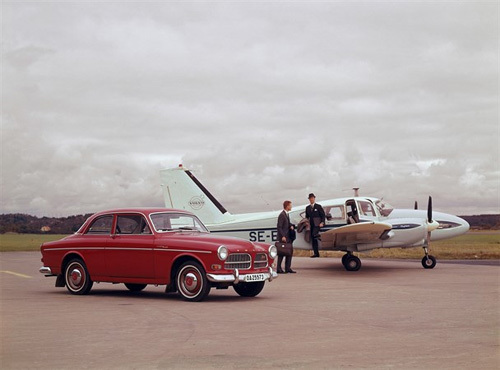 The Volvo Sport was the direct result of the many reconnaissance trips made to the USA by the company’s founder and MD Assar Gabrielsson in the early 1950s. In his quest to learn as much as possible about the market before launching Volvo on the other side of the Atlantic, he met a lot of people in the car world. One company that he came into contact with was Glasspar in Montecito, California. Since 1951 they had been building hulls for boats and bodies for sports cars using the new material fibreglass. Gabrielsson was very interested in the manufacturing process and wanted to find out how the material worked in Sweden. Furthermore, he had also noted in the USA that there was a huge interest in small, European sports cars – so Volvo ought to build one! 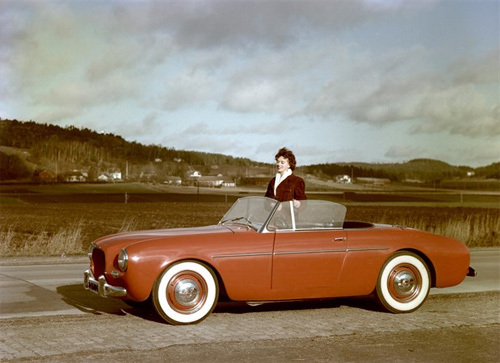 In 1953, Glasspar was tasked with designing a body, producing moulds, building the first prototype, and training Volvo’s staff in how to design and manufacture fibreglass bodies. Back home in Gothenburg, Volvo’s engineers were ordered to develop a suitable frame chassis that would fit the body. The project progressed at a rapid pace. 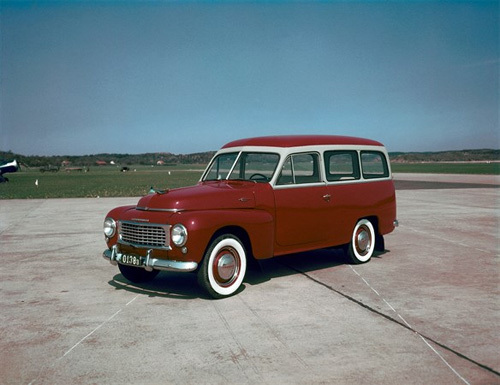 By the beginning of 1954 Glasspar had delivered the first drivable prototype to Volvo, although it was still far from fully developed. For example, it lacked a canopy top and side windows that could be wound down. The prototypes faced tough criticism during internal testing. The chassis was too weak, the plastic cracked, the doors fitted poorly, and the three-speed gearbox was far from sporty. 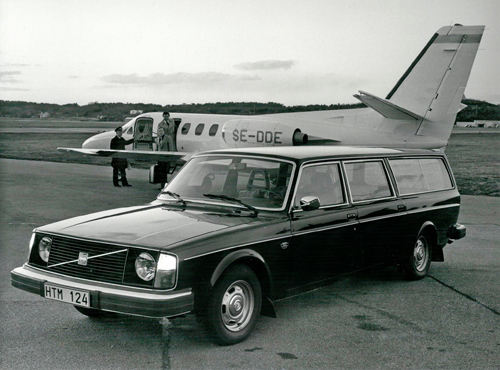 By the time of the presentation at Torslanda Airport another two prototypes had been completed and Volvo was able to show it was serious about its sports car project. 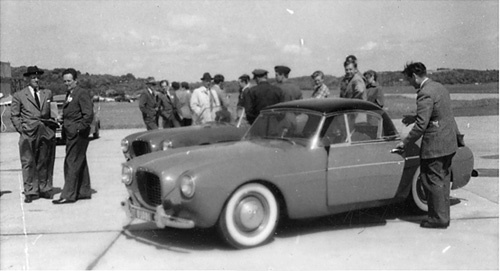 Those present were told the car would reach the market in 1955, and that a first series of 300 cars would be produced, all for export. Straight after the first showing, Volvo undertook a demonstration tour with the three cars, visiting all Volvo dealers in Sweden. 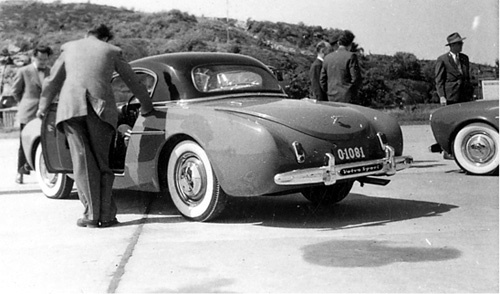 In the spring of 1956 the first cars were delivered to customers in countries such as South Africa, Brazil, Morocco, and the USA. 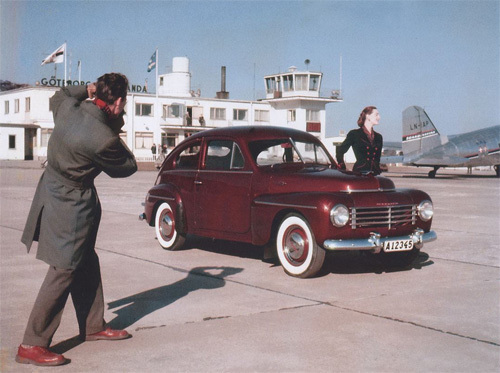 However, cars were also delivered to Swedish customers – the original policy that the Volvo Sport would be for export only had been reassessed. By that stage the car had been redesigned in several respects and now had a canopy top roof and windows that wound down. But the gearbox was still only three-speed. Production and sales were slow and during the first year only 44 were built. 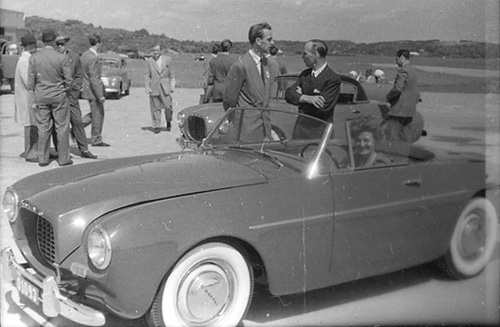 In 1957 another 23 were built, but after the newly appointed MD Gunnar Engellau got to drive a Volvo Sport for a weekend he decided that production should cease immediately. The car did not live up to Volvo’s quality requirements and the company was losing money on every car it sold. The total number produced was 67, but later research shows that two cars were, probably accidentally, given chassis number 20. That would mean that 68 Volvo Sports were built. Surprisingly, many of the cars are still in existence – the whereabouts of around 50 are known. 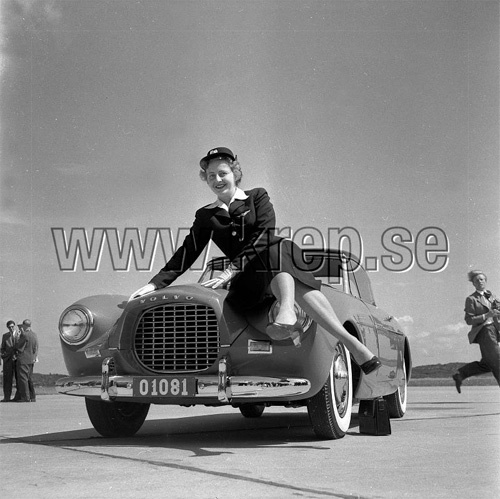 Despite the failure of P1900 – as the car was known internally – Volvo still gained useful experience from the project. Shortly after the stop in production of the Volvo Sport, MD Gunnar Engellau commissioned a new sports car – made from steel. 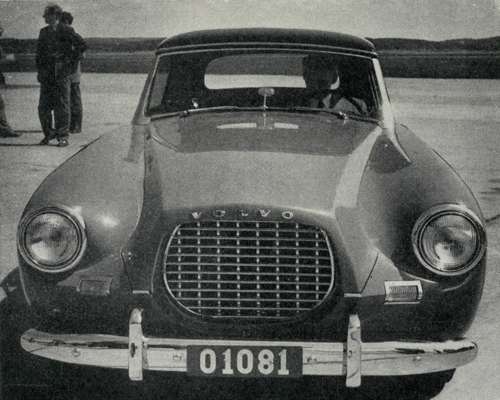 Four years later the Volvo P1800 was ready – and a significantly greater success for Volvo. More information at sv.wikipedia.org, and www.torslandaflygplats.se.